On October 21, 2017, the executive committee of the NAACP National Board of Directors elected Derrick Johnson President and CEO. 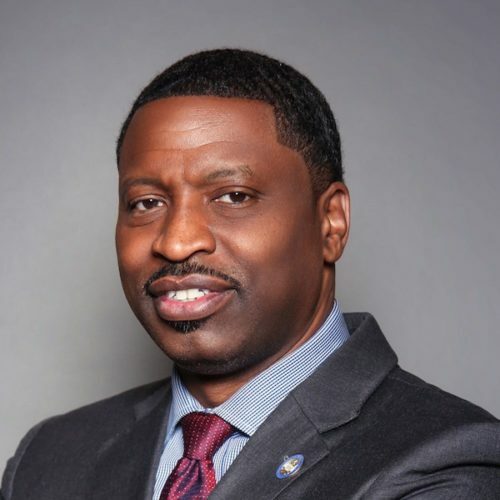 Derrick Johnson formerly served as vice chairman of the NAACP National Board of Directors as well as state president for the Mississippi State Conference NAACP. A longstanding member and leader of the NAACP, Mr. Johnson will guide the Association through a period of re-envisioning and reinvigoration. Born in Detroit, Mr. Johnson attended Tougaloo College in Jackson, MS. He then continued onto Houston, TX to receive his JD from the South Texas College of Law. In later years, Mr. Johnson furthered his training through fellowships with the Congressional Black Caucus Foundation, the George Washington University School of Political Management, and the Massachusetts Institute of Technology (MIT). He has served as an annual guest lecturer at Harvard Law School, lending his expertise to Professor Lani Guinier’s course on social movements, and as an adjunct professor at Tougaloo College. Mr. Johnson is a veteran activist who has dedicated his career to defending the rights and improving the lives of Mississippians. As State President of the NAACP Mississippi State Conference, he led critical campaigns for voting rights and equitable education. He successfully managed two bond referendum campaigns in Jackson, MS that brought $150 million in school building improvements and $65 million towards the construction of a new convention center, respectively. As a regional organizer at the Jackson-based non-profit, Southern Echo, Inc., Mr. Johnson provided legal, technical, and training support for communities across the South. In recognition for his service to the state of Mississippi, the Chief Justice of the Mississippi Supreme Court appointed Mr. Johnson to the Mississippi Access to Justice Commission, and the Governor of Mississippi appointed him Chair of the Governor’s Commission for Recovery, Rebuilding, and Renewal after devastation of Hurricane Katrina. In the wake of Hurricane Katrina, Mr. Johnson founded One Voice Inc. to improve the quality of life for African Americans through civic engagement training and initiatives. One Voice has spawned an annual Black Leadership Summit and the Mississippi Black Leadership Institute, a nine month training program for community leaders. 9:00 a.m.	- 12:00 p.m.